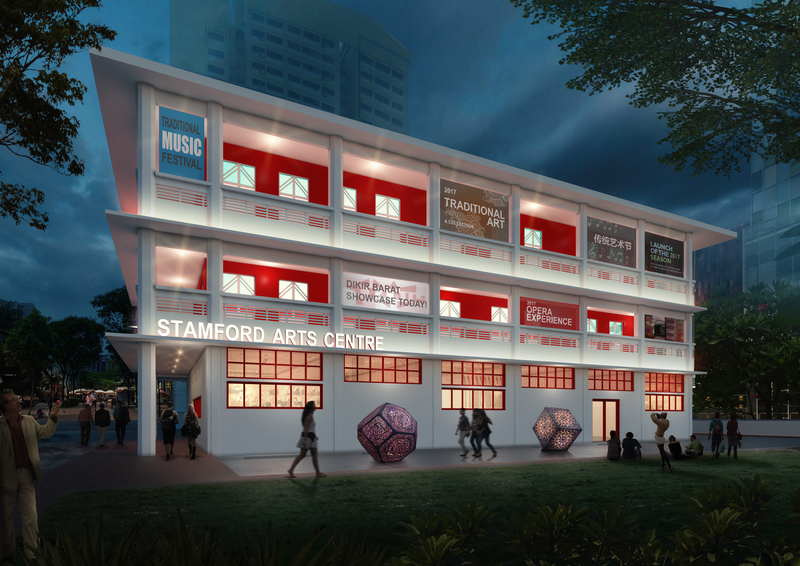 The Stamford Arts Centre will be developed as an arts space that is dedicated to the development of traditional arts content, and as a destination for the public to enjoy and appreciate traditional arts. It will house arts groups, artists-in-residence, a multi-purpose hall, as well as spaces for eateries. The centre aims to keep the rich and diverse forms of intangible cultural heritage alive in Singapore, make them relevant, and transmit them to future generations. The centre is centrally located in the Arts and Heritage District and Waterloo Arts Belt, and its neighbours include the Sri Krishnan and Kwan Im Thong Hood Cho Temples, as well as arts schools such as the Nanyang Academy of Fine Arts and LASALLE College of the Arts. Having these arts schools and religious and cultural institutions all in one space makes it conducive for the meeting of the young and old, as well as those from different cultures. Accessible to people from all walks of life through its diverse range of arts offerings, the centre will bring the traditional arts closer to the community to participate in and discover.